Hillary Clinton makes an appearance on The Breakfast Club. Hillary Clinton has been on a roll recently. A pandering roll, some might say. She was seen playing dominoes last week, and—gasp—she actually won. Or got lucky. 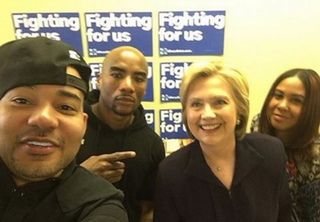 And then there's her recent appearance on The Breakfast Club with Charlamagne tha God and company. During Clinton's interview, she told the crew that she keeps hot sauce in her bag. OK, she must have heard Beyoncé's "Formation" before she went on the air, so that was cute. I get it, Hilly is trying her best to be "down." She wants to appear relatable. And in her latest attempt at relatability, she brought up a subject that's near and dear to my heart: hot sauce. In her Air Force plane, which stocks fruit, almonds and Tabasco sauce, which she dribbles on nearly all foods, including salads, she slept on a foldout sofa in a private cabin. So apparently Clinton is a fan of Tabasco, which is a brand of hot sauce, most commonly not found in black households. Don't you hate it when you're at a restaurant and they give you Tabasco instead of Frank's RedHot, or Texas Pete, or Louisiana Hot Sauce Original, or Crystal? Wait, that's just me? Never mind. I'm going to need Clinton to try a little harder when referencing hot sauce. If you're going to be down, be all the way down. I'm sure Rachel Dolezal would never say Tabasco.